I spoke at the Reinvented Toilet Expo on November 06, 2018 as a speaker in "Sanitation Change-Maker Speakers' Series". Those who attended the Expo, co-organized by Bill and Melinda Gates Foundation and the Government of China, might find this video already familiar. I am happy to share this link from the Gates Foundation's Youtube channel for those who are interested in hearing how we are trying to engage public in investing into the better healthier and environmentally friendly toilets. 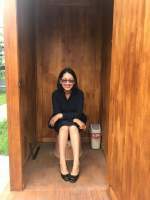 Leading a movement "Let's Change Our Toilets" in Mongolia.